Carbon fiber is the material of choice for high stiffness and tensile strength applications. Carbon fibers may be made from several precursor materials, with polyacrylonitrile (PAN) being the most widely used raw input constituent. The crystalline structure of carbon atoms produces a fiber with high stiffness and tensile strength, and low thermal expansion. Carbon is sold in the form of tow (yarn), woven or knitted fabrics, and prepregs (pre-impregnated with epoxy or other matrix resins). While carbon fiber is more expensive than traditional glass fiber, the stiffness and strength to weight ratio are significantly higher. 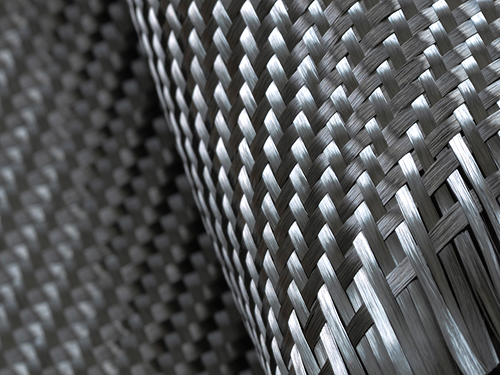 Carbon fiber is used in a wide variety of cutting-edge applications including aerospace, transportation, sporting goods, and many new composites applications. The Benchmark Group supplies our carbon fiber woven cloth is a variety of grades from 1k to 10k quality. We offer dry and pre-pregnated carbon fiber products.